Former Royal Navy Sea Devon XJ348 is preserved in its military markings at Hermeskeil in Germany. Before the Britten-Norman Islander, the De Havilland Dove was Britain's best-selling civil transport with 542 produced between 1945 and 1967. The aircraft emerged from the 1943 Brabazon Committee's requirement for a feederliner to replace the Rapide on internal UK routes. The first prototype, G-AGPJ, first flew at Hatfield on September 25, 1945, and featured twin De Havilland Gipsy Queen 71 engines and a retractable landing gear based on the Vampire fighter. The type entered production in the austere post-war years when the purchase price of £20,000 was beyond most of its customers, especially with so many war surplus Dakotas and Ansons around. The fatal crashes of the second prototype and third production aircraft might have proved the end but gradually the orders came in. The series 1 could seat eight passengers but the series 2, introduced in 1948, accommodated six in an executive layout. This version soon proved popular with major companies. 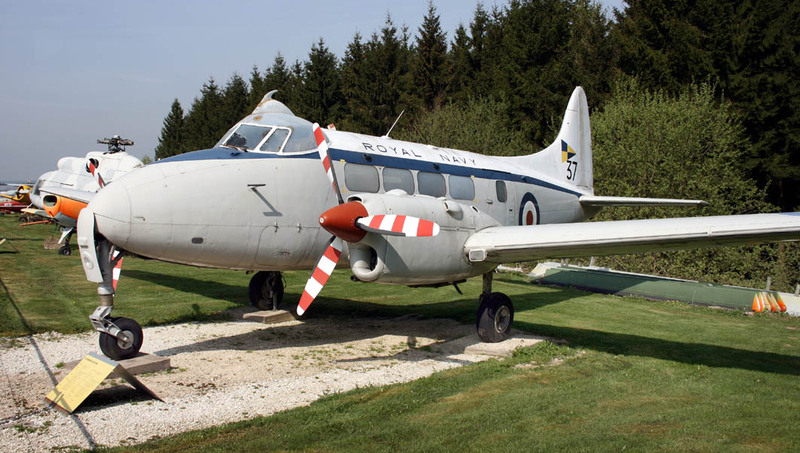 The series 4 emerged as a military communications aircraft, entering service with the Royal Ar Force as the Devon C1 and the Royal Navy as the Sea Devon C20. The Dove 5 and 6 of 1953 featured the uprated Queen 70-2 engine, which increased payload. The final models were the 7 and 8 which introduced even higher performance engines, the Queen 70-3. These featured a raised cockpit roof, similar to that on the company's larger Heron. Carstedt of Long Beach, California, produced the Carstedt Jet Liner 600 in 1966 which featured a lengthened fuselage for 18 passengers and twin Garrett-AiResearch TPE331 turboprops. Today the Dove flies in limited numbers around the world, with several owned by historic aircraft operators in the UK and New Zealand.